From concept through to completion, U.S. Nameplate Company is a one-stop shop, ready and able to manufacture all of your identification products’ requirements. The process begins when products are requested online or through a U.S. Nameplate Co. representative. We are please to offer custom solutions for both metal and flexible products ranging from decals to graphic overlays to aluminum tags of all kinds, saving our customers time and money. Once your request is processed, a quote is generated and submitted in 48 hours or less. Once the customer accepts the pricing/processes, they can then submit a purchase order. 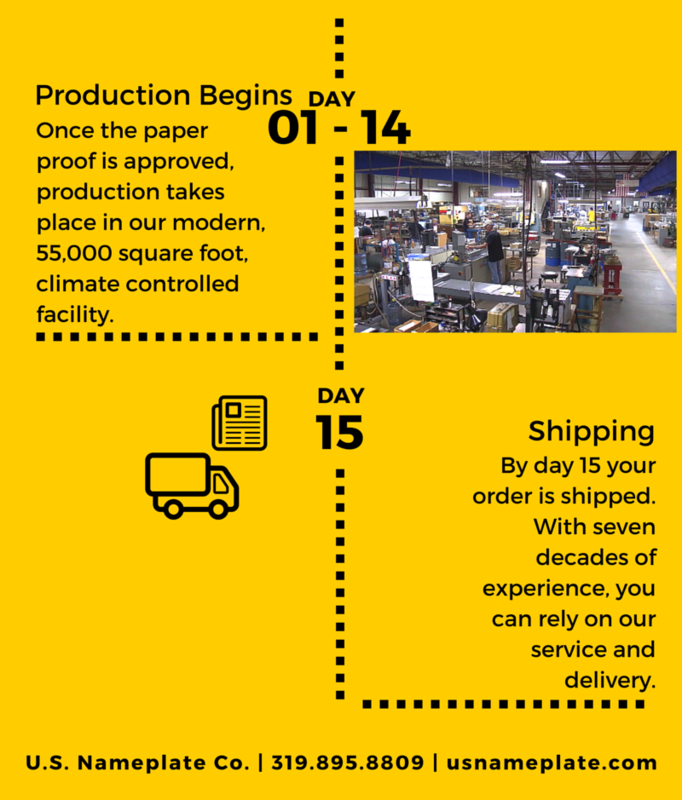 As soon as the purchase order is received, a paper proof is created in 48 hours or less. Once the paper proof is approved, production takes place in our modern, 55,000 square foot, climate controlled facility. By day 15, your order is shipped. With seven decades of experience, you can rely on our service and delivery. Contact us for more information about our processes or get a quote. We’ve built our reputation on solid work principles: reliability, professionalism, quality, and hard work. For more than 70 years, U.S. Nameplate has been the supplier of choice to more than 3,000 Original Equipment Manufacturers across the globe. We’re proud that so many people put their trust in us. We realize many companies are still seeking reliable industry partners. If you’re in the market for a nameplate manufacturer you can trust, make sure you do your research. You need to be sure you have an excellent partner that manufactures high-quality products based on your specifications and timeline. What types of metals and plate thicknesses do you offer? Verify that the companies you interview have products that fit your industry. US. Nameplate uses aluminum, anodized aluminum, Metalphoto®, brass and stainless steel in thicknesses ranging from .005-.125. What kind of design customization requests can you meet? Just as no two people are alike, no two company’s needs are the same. You have unique specifications and you need to make sure your OEM is up to the challenge. Our experienced art department will take your blueprint or artwork and transform it into a press-ready proof. What are the sizes of your production runs? Some companies are better equipped to handle small orders; some prefer large print runs. Depending on your needs, you should know a company’s capabilities. At U.S. Nameplate, we produce orders of any size. We can meet all your production needs. What are your hours of operation? If you have an order or a question, you want to be sure you can reach someone immediately. We pride ourselves on our availability. Our Customer Service Representatives are available 8:00 AM – 4:30 PM CST, Monday – Thursday, and 7:00 AM – 3:30 PM CST, Friday. You will always reach someone in person. Isn’t that better than talking to an automated machine? Who will be handling my order? Many companies outsource. At U.S. Nameplate, we’re a one-stop shop, ready and able to manufacture all of your identification products requirements. We will handle every aspect of your order in our modern 55-thousand square foot climate-controlled facility. How long do your nameplates last? Avoid the problem of having to re-order poorly made products. Our metal nameplates are guaranteed to last up to 25 years even in the most rugged of outdoor conditions. This long-lasting quality saves you time and money. What is your delivery turn-around time? If you need an item, you probably need it immediately. We can store your nameplates in inventory for just-in-time delivery. That means you can order ahead and U.S. 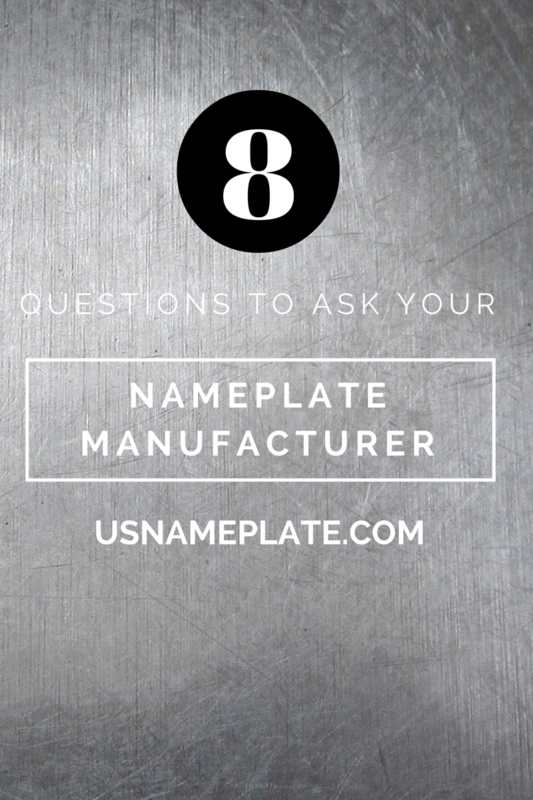 Nameplate Co. will hold the parts until you need them. We’ll bill you when we deliver, not when you place your order. What associations do you belong to and what affiliations do you have? Industry-specific trade associations and memberships in other organizations — like the Chamber of Commerce and the Better Business Bureau — show that the company is interested in its reputation. U.S. Nameplate is a proud member of Farm Equipment Manufacturer’s Association, Association of Equipment Managers, Association for the Work Truck Industry, and Specialty Graphic Imaging Association. We hope these questions help guide your discussions. Sometimes a simple phone call can tell you volumes about a company’s culture. At U.S. Nameplate, we are friendly and professional in all we do. We welcome the chance to be your supplier of choice. Etched Metal Nameplates: Built for outdoor and harsh conditions. Rugged. Robust. Resilient. For more than 70 years, U.S. Nameplate Co. has made products that last. We know that the industries we serve — including mining, military, and construction — need nameplates that will withstand harsh conditions. U.S. Nameplate Co. built our reputation by manufacturing high quality metal nameplates. Since then, we’ve grown our business to suit the needs of our customers. We offer etching, stamping, and embossing on our nameplates and will work with you to custom design the perfect product. Our aluminum etching process creates plates that can last up to 25 years. These long-lasting products save you time and money. Specially designed to weather rough outdoor environments and extreme temperatures, etched nameplates are ideal for use in industrial, and transportation industries. Choose an etched metal nameplate for any task where you need easy-to-read signage or instructions. At U.S. Nameplate Co., we use a chemical etching process that works especially well for data-rating plates, asset tags, serial plates, and vehicle identification number (VIN) tags. U.S. Nameplate Co. works with engineers, buyers, project managers, owners, and marketing professionals to ensure you get exactly what you need for your specific use. Choose from a wide range of sizes in anodized aluminum for your etched metal nameplates. We like aluminum because it’s a lightweight, economical, and strong material. Most widths can be sheared, machined, or hand tooled with ease. Once we know your specifications, we use a powerful chemical to cut — or etch — your design into the metal surface. If you select a colored aluminum as your base, we can strip away the coloring as we manufacture the plate. Contact U.S. Nameplate Co. today for your etched metal nameplate needs. You’ll appreciate that we’re a one-stop-shop. We handle every detail of your order — from customer service to design to manufacturing — inside our 55-thousand square foot facility. We’re prompt, professional, and friendly. U.S. Nameplate looks forward to being your supplier of choice. In an increasingly litigious society, companies know they must take certain precautions to avoid lawsuits. In fact, “failure to warn” and “inadequate warning” cases have been on the rise. The more you can do to protect your employees and customers, the more you’ll protect your bottom line. U.S. Nameplate Co. has been manufacturing labels since 1946. 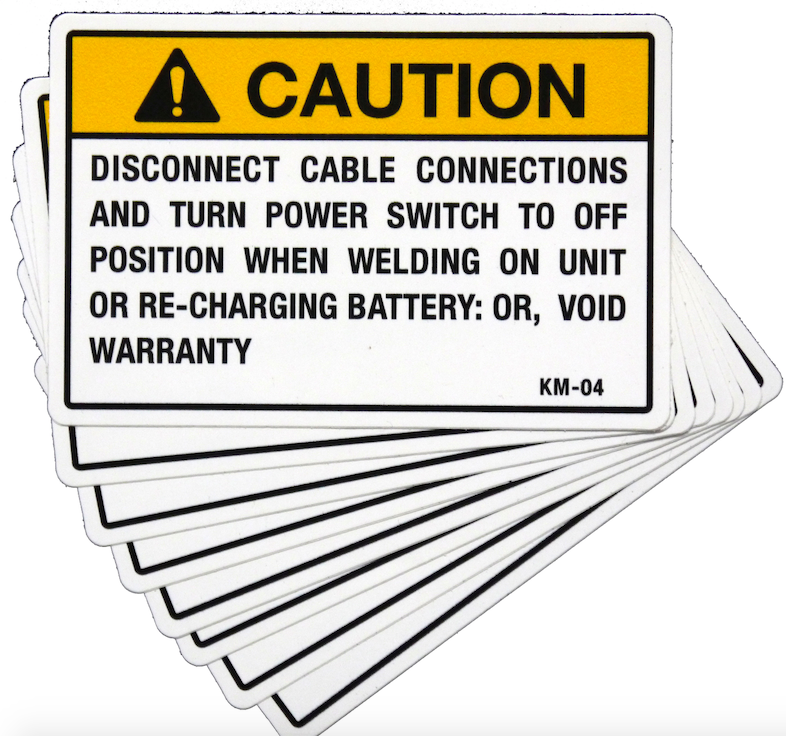 We work with a wide variety of original equipment manufacturers (OEM’s) and we know the importance of long-lasting and durable industrial safety labels. Safety labels should be the most visible part of any piece of machinery. If the label is not legible or becomes worn over time, your company runs the risk of accidents and lawsuits. 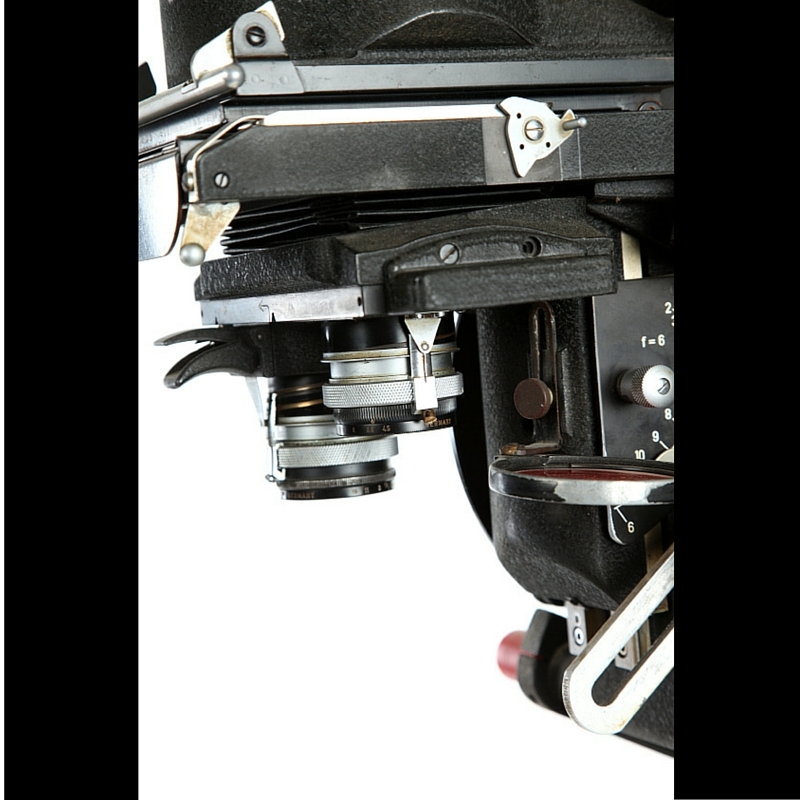 The clearer your safety label, the lower the chances for product liability litigation. At U.S. Nameplate Co., we listen to your needs. In order to provide the best design, we must learn more about your industry and understand how our products will be used. Will our labels be subjected to harsh weather conditions? Do they need to be visible from long distances? Will they be affixed to moveable parts? Do you need text only (i.e. safety instructions or hazard alerts) or text and symbols? Who is your intended audience? The more details we have, the more customization we can provide. We’ll also talk with you about materials, designs, and finishes. U.S. Nameplate is proud to offer many design options for your safety labels: screen or digital printing, laminating, embossing, thermal transfers, and die or diagonal cuts. We design and manufacture safety labels for many different industries, including construction, mining, medical, original equipment manufacturers and the military. Each type of industry has unique standards and requirements, which may include ANSI, CE marking, UL-compliance, WEEE/RoHS, or ISO. All industries have one thing in common, however. They need easy-to-read, easy-to-understand, and long-lasting safety labels. Sometimes text alone is not enough, especially when it comes to different languages. Sometimes labels require special colors, formatting, and custom symbols. At U.S. 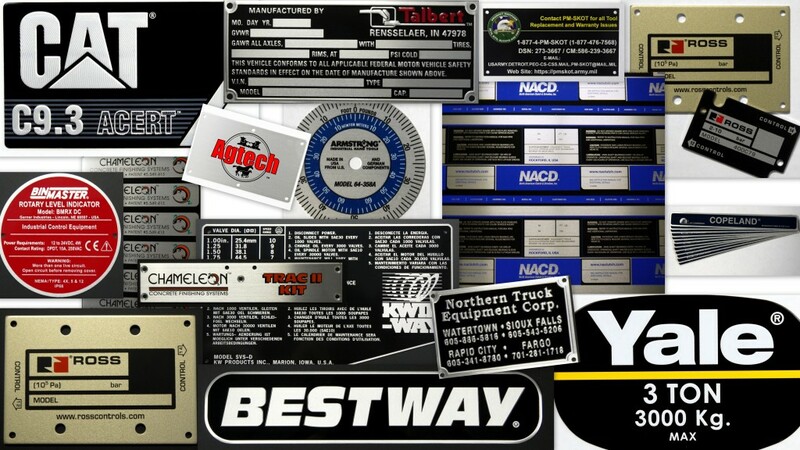 Nameplate Co., we’ve been supplying labels to businesses across the world for nearly 70 years. We’re experienced professionals and will help you every step of the way. 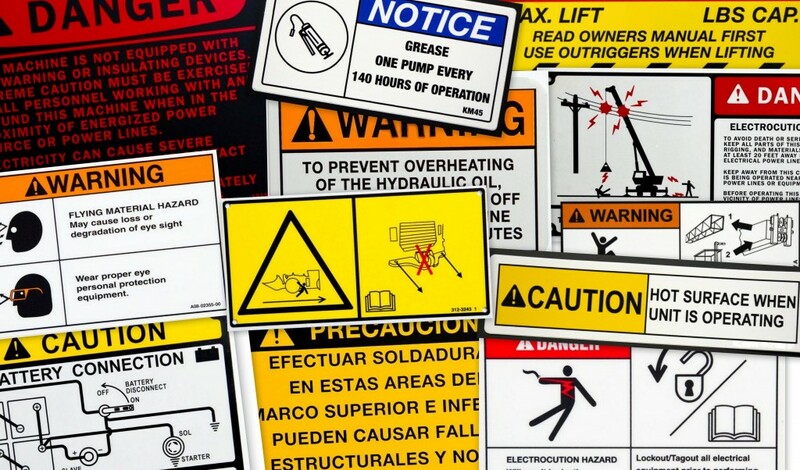 Safety labels are critical in today’s business world. They protect everyone: your workers, your clients, and your company. Put safety first. Call or contact U.S. Nameplate Co. today to see how we can help with your next project.